Set within a private 3 acre property in a picturesque pocket of Chewton, it overlooks Forest Creek and surrounding Goldfields heritage bushland. A walking track is at the door for a 15 minute walk to the wonderful Bold Cafe and Nursery and the Wesley Hill Saturday Market , or continue on to explore nearby Historic Castlemaine with it's wonderful Architecture and vibrant café and arts culture. 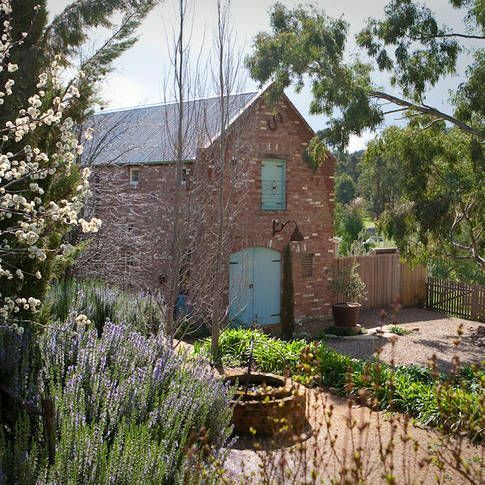 Red Brick Barn is an eclectic mix of European and Early Australian antiques, including French Industrial Furniture and Lighting, Turkish Kilims from Anatolia and rare "Depression" pieces from regional Australia. The charming main loft bedroom is furnished with an antique cast iron bed (Queen) with hand-made Portuguese pure linen, feather pillows and quilts. Original French art pieces, Turkish kilims and 180 degree views complete the picture. within the loft is the 2nd sleeping area, which offers an antique Portuguese day-bed with linen wing-back chair, ottoman and vintage American quilts. Large early-Australian table surrounded with rare 1920s French metal Tolix Chairs, with access through French doors to the courtyard. Relax in the comfy linen couches surrounded by early painted furniture and eclectic finds. Enjoy the view through the large picture window which overlooks the private paved courtyard garden, donkey field and forest beyond. Shower in the Terracotta floored flow-through bathroom with views across the fields, or if the whim takes you bathe alfresco in the claw footed bath in the courtyard, perhaps with a chilled wine on a frosty night under the stars. The private courtyard includes an under-cover dining area with vintage french cafe chairs and table and is equipped with a BBQ for your alfresco dining. A Steam Train to gorgeous Maldon and surrounding country towns. Lavandula, Swiss Italian Lavender Farm. Great food @ The Public Inn, The Good Table , Apple Annie's and the Bold Cafe. The barn is very beautiful, fresh and peaceful. The bedroom upstairs was so nice and airy. I think this place is special because of the extra things that the owners have provided and the attention to detail. I really appreciated the simple breakfast provided, which was just right. And there is a lot of great reading material on a range of entertaining subjects. It is a quirky place and it is fun to stay there! This house has a lot to offer and the owners have gone out of their way to make guests feel welcome. It's lovely. A unique property - incredibly comfortable, beautifully and thoughtfully appointed and furnished without pretentiousness. We enjoyed the location and garden/bush outlook which provided enough solitude for a relaxing break but was close enough to attractions of Chewton and Castlemaine. Beautifully built and styled "barn" The type of place you sit on the comfy couches or outside on the cool verandah reading interior magazines and drinking wine. Bliss! Daniel and Glenny were exceptional hosts. The barn is stunningly gorgeous and they make you really feel at home with luxurious bathroom toiletries, fresh flowers, fruit, bread and milk. The setting is very private and gets you back to nature. Having a warm outdoor bath or shower in the evenings really sets this beautiful accomodation apart. Could not recommend to stay here enough and also the hospitality of Daniel and Glenny. Gorgeous warm and welcoming people. This was a perfect little getaway. Only 1.5hr drive from Melbourne but felt like a million miles away. Cottage was perfect. I loved the huge picture window overlooking the paddock with the sheep and donkeys. Very clean and spacious. Bathroom was great and I loved that there was a toilet both upstairs and down. It’s only a 5 min drive into Castlemaine and the local taxi company were quick and priced well. Average trip into town to get to the pub was around $12. Plenty of walks nearby and the visitor info centre is excellent. Note that Vodafone has no reception at the barn but Telstra was fine. I actually loved not being contactable though! Thanks for a wonderful stay, we needed to recharge the batteries and Red Brick Barn was the perfect spot. Daniel and Glenny are such wonderful hosts with a beautiful place set up to make you feel at home. Thank you, we look forward to visiting again soon.